U.S. government debt yields followed international rates higher Friday as investors in the United States pivoted toward riskier assets on the week's final day of trade. 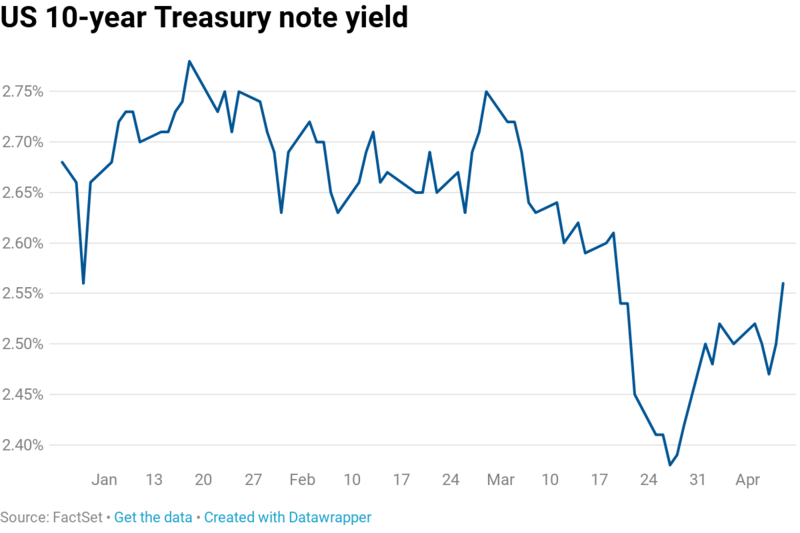 The yield on the benchmark 10-year Treasury note rose to about 2.558%, while the yield on the 30-year Treasury bond also climbed to 2.971%. Bond yields move inversely to prices. Much of the weekend optimism stemmed from new economic data that showed Chinese bank lending was on the rise in March and that the country's trade surplus soared beyond analyst expectations. Dollar-denominated exports during the month of March rose 14.2% from a year ago, surpassing forecasts of a 7.3% rise from a year ago, according to a Reuters poll. The better-than-expected economic data helped quell some traders' angst over the ongoing financial slump in China and helped buoy stock indexes around the world given Beijing's influence in international markets. In the U.S., prices for goods imported rose 0.6% in March on a month-over-month basis, boosted by a rally in crude. However, barring the higher oil prices, import prices were up just 0.2% in March. "The defensive, must-own-Treasuries, buying posture of the last few days seems to have vanished in favor of equities," Kevin Giddis, head of fixed income capital markets at Raymond James, wrote to clients. "The Fed is not as dovish as the market believed, the economy is on better footing than many expected, and earnings are coming in higher than their forecasts." UBS noted in an email Friday that the U.S. economy is decelerating but it is yet entering a recession. Furthermore, traders are keeping a close eye in the stock market with a new earnings season kicking in. U.S. Federal Reserve Vice Chairman Richard Clarida told CNBC on Thursday that officials at the central bank see no reason to move interest rates in either direction at present. Clarida's comments came a day after the FOMC released minutes from its March meeting, at which the Fed adjusted its forecast to no rate moves this year. The minutes reflected a central bank that will watch data closely this year, with some members leaving open the chance of a rate hike if conditions continue to improve.